Depression is the worlds fourth biggest cause of death, predicted to be number two within the next decade. If your body has very low levels of omega-3 fatty acids, you are more likely to suffer symptoms of depression (or other psychological disorders), than someone who does have high levels of omega-3's in their body. Studies prove this (read later). Perhaps this would explain then, why there is so much depression around us, when you understand that the majority of the population is omitting this fundamental element from their diet. Generalising, we readily consume plenty of bad fats, like the ones in the fast foods at burger bars, and in processed foods that make up a huge part of ‘normal diet'. But we neglect to include good fats like oily fish, seeds, nuts and olive oil, in our diet which are crucially good for our health. The antioxidant effect of krill oil is around fifty times more potent than fish oil and it contains higher concentrations of omega -3 fatty acids than its fishy cousin. It is also far more easily absorbed into your system than fish oil, which means that it acts quicker from the time you consume it. Plus, your body uses more of it. Aside from helping to rid your mind of psychological problems, krill oil has many other health benefits which you can read about, throughout this site. This healing oil, which comes from the icy-cold crustaceans in our oceans, has been proven to help depressed people to perceive their lives in much healthier and less stressful way. You will find more on this study further into the article, but already, can you see how krill oil could help you, if you are depressed? Whether you are here for yourself or for a loved one, we hope that this article will help you in some way. Either to realize that you are not alone and there are certain positive changes you can make in your life, so that you can regain cognitive function. Or maybe the following information will help you recognize abnormal behavior and other symptoms of a partner or friend, giving you the knowledge and strength to help them. Everyone has the right to feel low and unhappy. There can be a barrage of negativity in our lives that make us feel this way. But people suffering from depression may have these (and more serious) feelings on a daily basis, or even constantly, which makes getting through what should be an ordinary day, an absolutely massive challenge. The cause of depression can be attributed to any number of things, although medically, it is still a mystery. Why some situations affect different people in such a detrimental way than somebody else, is something that is being continually studied and researched. But we do know enough about this illness to know that life events such as marriage and relationship breaking downs, family deaths and ill health can cause someone to become depressed. How do you know if you're depressed? People with depression almost always cannot explain why they feel so low. They just do. And they find it hard to complete normal everyday tasks which have previously been second nature. Everyone has low or sad moments in their life, which normally return to happy and enjoyable moments. So, how do you know if or when you need to talk to your doctor about the way you are feeling? We are emotional (human) beings. It is how we were ‘designed'. But when you are depressed, you feel sad, anxious or stressed for longer periods – days, weeks or even months and years. And there may not even be any ‘real' reason for the way you feel in any given moment. Something may happen at any moment to pull your ‘psychological trigger', putting your mind right back to that awful or difficult time. Immediately, you get that deep and dark feeling of sadness or anxiety, which may cause you to retire to a ‘safe' place, like your sofa or your bed under the blankets. Even if you have responsibilities like a family and children depending on you, or a job that you may love and thoroughly enjoy. You might frequently ‘shirk' those responsibilities, losing complete interest in your daily existence, even though you know that others are depending on your positive actions. You just don't have the mental focus and your brain will not click into that next ‘gear', which prevents you from getting things done, no matter how hard you try. You could also have a certain feeling of hopelessness, depending on the degree of your depression. You might be surrounded by a great support network of friends and family, but you still feel very alone and helpless. Or you could be continuously tired, and have poor sleep patterns. These are also recognized symptoms. Not being able to sleep at night, then feeling totally wiped out and taking naps during the day, are also an indication that you are at a point where your body is confused. The scale of symptoms vary from person to person, depending on the degree of depression (or anxiety and stress). So far we've talked about behavioral issues and feelings of sadness or that feeling of despondency. But at the worst end of the scale, that low emotional state of mind, might mean that life is not worth living and that suicide is the only option. Unfortunately, you hear about such sad things more and more, with increased growth of social media nowadays. Having a little understanding about how your brain works will help you appreciate how antidepressants work. In your brain, messages are sent between the cells of your brain (neurons) called neurotransmitters. It is the neurotransmitters called serotonin and norepinephrine that communicate your mood, emotional state, appetite and many other bodily functions from neuron to neuron. There are many other neurotransmitters, but these two in particular, are the most important which work to influence your mood. The journey between those neurons is called the synapse. This is where chemical changes occur and where antidepressants can be effective (or ineffective) in influencing your serotonin and norepinephrine levels. This is however, a very ‘broad description', as different types of antidepressants work slightly different to each other. But you get the general idea of how they affect neurotransmitters. 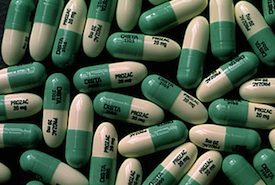 Antidepressants are a multi-billion dollar industry that first started with Prozac in the late nineteen eighty's. They are one of the most prescribed drugs in the United States and the UK? It revolutionised how Americans dealt with their darker emotions. It was, and still is, easy to obtain. Actually, it is easier to get them prescribed today. But the sad truth is, that this powerful drug is not working for most people any more than a placebo would. The antidepressants you are currently taking may not be working for you. In fact, they could be making your symptoms worse. They have many side effects, which include nausea and sexual disfunction. Anti-depressants can also cause future health problems, like birth defects if you are woman and were to get pregnant. They could make your condition so much worse, it might cause you to want to take your own life! I imagine this is something that your primary care doctor has not told you. However, antidepressants do work, but for the right people and can be really helpful in treating their symptoms. But if you are the wrong type of person, they could make you more irritable and impulsive, making decisions that you would normally not make. You see, the medical profession has changed in recent years. Today, it is easier to pull out a prescription pad than to actually spend time with a patient, to get to know them and to decipher their condition. The ‘system' encourages doctors to write prescriptions, because in almost every case, insurances are structured not to allow referral to mental health professional. Instead, your doctor who may not be trained in psycho-therapy or in the assessment of depressed people, may just write you a ‘note' so you can take it to the pharmacy and pick up a bottle of pills. Unfortunately, we have become a ‘pill society'. And it is often, the flooding of drugs into your brain that causes its chemistry to go haywire! This effect on your serotonin levels may also cause your body to have side effects. And if you have taken antidepressants once, you are almost certainly going to suffer from depression again sometime in the future. Did your doctor tell you that you have bipolar or unipolar depression? A doctors evaluation usually doesn't allow them to differentiate between bipolar or unipolar symptoms of depression. You are just depressed. “But what is the difference between the bipolar and unipolar?”, I hear you ask. Cutting the ‘scientific mumbo-jumbo' out of the equation, some patients brains need stimulating, while others require a more calming solution to their condition. A doctor can't get this in just one interview with a patient. But, the same medication is given for both types of brains. So the problem is the same medication being prescribed for differing types of depression, and for these other conditions, even though that drug could interact with the brain and cause further damage and future health complaints. There are other forms of depression like post-natal or postpartum depression (which a new mother might get after giving birth), or SAD (seasonal affective disorder). Could the High Omega-3 Content of Krill Oil Help Relieve the Symptoms of Depression? Having a deficiency of essential fatty acids in your system is likely to make your mood low and make your sleep pattern abnormal. It is also likely to make you lack the energy to function normally throughout the day and it could also affect your personality (in extreme cases). Krill oil could help to alleviate the symptoms of depression by boosting your omega-3 levels. And krill oil has a much higher concentrate of omega-3 fatty acids than fish oil, making it far superior. It seems all throughout this site, we talk about how krill oil can help with bad things like depression. But it does shine a rainbow over us too, because the components of krill oil can help boost fertility in women, and in men, helping greatly increasing the chances of conception. Studies have been done of the effects of omega-3's on depression, and they have shown positive results. This research has shown that people living in an area where fish are consumed as part of their daily diets, rates of depression, bipolar disorder and even people suffering from seasonal affective disorder are much lower than other parts of the world. In other studies, researchers discovered those who took omega-3 supplements over an eight week period, showed considerable signs and symptoms of depression. Even patients who never responded to treatment with antidepressants displayed great improvements in their well-being. Dealing with depression is no easy feat, but you can help yourself and you can get help. Firstly, add krill oil to your diet. Take it as indicated on the container it arrives in. You have everything to gain by increasing your omega-3 count. And if there was one other simple, but important message we could pass on to you is to ‘get moving'. Run, swim, lift weights, cycle or even just take regular walks. Do whatever it takes to work your cardiovascular system on a regular basis, boosting your heart rate and pumping your blood around your body quicker. You will radically improve your nervous system and your emotional thought process, just by elevating your heart rate through (preferably, vigorous) exercise. You will feel a lot better than if you just sit around like a couch potato, waiting for your next anxiety attack. This is another fact, so don't ignore it. If you are sat around all day thinking about why life is so bad, guess what? It's going to feel bad. But when you exercise, serotonin is released into your system, which can do nothing else but help you view the world in a better light. You may already be somebody who exercises regularly and eats a healthy nutritious diet and you're still depressed. In extreme cases of manic depression and bipolar depression, patients need more than to make changes to their life. If are someone who fits into this bracket, then you may need talk treatments or psychotherapy.